ENCOURAGING, if somewhat patchy falls since Thursday of anywhere from 25-150mm across eastern parts of Queensland and New South Wales have applied a handbrake to slaughter cattle over-supply and price deterioration this week. There has been a dramatic decline in saleyards numbers since the rain started late last week, with many centres this week recording yardings less than half the size of a week earlier. Prices have firmed, with some cow descriptions up 20-35c/kg up on the previous week, and now more closely aligned with direct consignment offers. The lift in the saleyards market, boosted also by some renewed restocker activity, has served to put a handbrake on the recent slide in direct consignment slaughter cattle pricing. 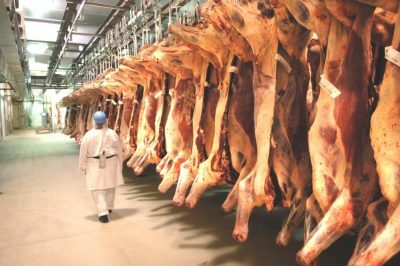 While the rain has caused a few isolated cancellations of direct consignment cattle deliveries early this week, the sheer volume of earlier bookings has meant there is no real disruption to processing operations, Beef Central was told. In fact several plants are still planning to kill Saturdays heading into April, to meet current supply demands. After a series of sharp downwards adjustments totalling 50-65c/kg in some categories since late February, processor grid offers in southern Queensland this morning were unchanged on last week, with best heavy cow offers at 375-380c, and four-tooth grassfed steer 460-475c, depending on plant location. Just a month ago, southern Queensland heavy cows were still worth 440-445c/kg and four-tooth steers 520-525c. This time last week several Queensland processors were not offering quotes due to heavy supply pressure, but all operators have active grids in the market this week. Saleyards from Roma to Wodonga have all reported greatly reduced yardings since Friday. Bookings for today’s Roma store sale fell to below 2500 head, after a series of weeks of 6500 head or better. There’s also some clear evidence of restockers entering the market, where nearby rain has fallen. At a Blackall sale in western Queensland last week, competition from areas further north around Winton and Julia Creek, which face fresh feed after February rain, helped boost store steer prices by 20-40c/kg since the start of the month. Further south, today’s Gunnedah sale yarded barely 1000 head, down from 2500 the previous week. Prices rose, with some restocker activity re-emerging, in the wake of local rain. Numbers yarded also fell 25pc at Barnwartha this morning, and reduced by more than half at Naracoorte today, where prices lifted for most categories. Last week’s eastern states kill recorded by NLRS would have easily been a 2019 season record, except for Monday public holidays in Victoria, Tasmania and South Australia. The five-state tally to Friday of 152,178 head was just 2000 short of the seasonal record set a fortnight earlier, achieved despite a 17pc decline in week-on week kills in Victoria (22,747 head) and 21pc in Tasmania (3954 head) caused by the holiday break. Add full five-day kills in those states, and last week’s tally would have been well above 156,000 head. On the back of additional Saturday shifts being worked at some plants due to supply pressure, Queensland’s kill last week lifted another 6pc to 82,914 head – easily the largest tally for the year, and up an incredible 34pc on this time last year. Last week’s NSW tally was up 1pc from an already high kill the week before to 36,641 head, 9pc higher than last year. The female portion of the NSW remains high, at 55.5pc. South Australia’s kill last week was up 12pc to 5922 head.